Just a year ago, the ORR Safety sales teams worked a little differently. Many of their seasoned sales professionals were using new iPhones at the same time they were scribbling sales notes on Post-Its. They were embracing a modern inbound marketing pipeline, but taking notes on paper to be dragged around in banker’s boxes from home to work and back again. It’s this juxtaposition of new and old--tech-savvy and tech-shy--that had finally become too cumbersome for the established but growing safety company. They were battling questions like, “When’s the right time?” and feeling overwhelmed when evaluating the many CRMs on the market. In October of 2017, we had already been partnering with the ORR companies (ORR Safety, ORR Protection and ORR Corporation) for 3 years. We had launched full digital marketing campaigns using HubSpot’s marketing automation platform. We had already modernized their renowned in-person fire protection and safety equipment seminars to webinars that were lead-generating machines. But this struggle to take their old-school sales system online was just now reaching a tipping point. The ORR Safety team was having trouble keeping seamless sales conversations with prospects if a team member was out of office or if the sales representative left the company. They also struggled to get new team members up to speed and scale their staff--and they had no ability to extrapolate any kind of meaningful data around conversion rates or pipeline forecasting. And ultimately, there was no accountability for sales team members or transparency for leadership. Click play to hear how Zach Nelson, ORR's Director of Marketing, felt about solving for his sales reps with the HubSpot CRM. The ORR team was also feeling overwhelmed when it came to evaluating all the CRMs on the market. Microsoft Dynamics was bigger, and Salesforce and NetSuite had more name recognition. But their existing relationship with HubSpot (and Revenue River as a HubSpot Partner Agency) would provide a much faster launchpad for their sales enablement. We assured them that the HubSpot CRM was an excellent option for their initial CRM, and we were confident that--over time--we could help them see the incredible staying power of the tool as a permanent solution for their sales team instead of this more temporary starting point. Together, we talked through the benefits of the HubSpot CRM, demoed the tool with their stakeholders, and came to an agreement that this was the right path. We planned an aggressive initial build phase of their first-ever online sales system for just two months later, and we prepared for the many obstacles that might come in our way as we worked to unite their marketing and sales automation for more impactful reporting, analysis, and scaling of their sales processes. 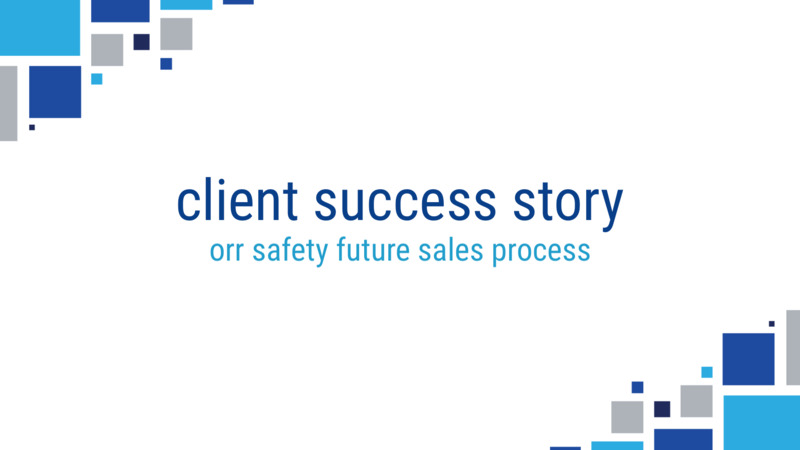 Over the next few weeks, we built a heavily researched, custom sales enablement system designed to draw ORR Safety sales team members in with buy-in of the HubSpot CRM and the impact this would have on their day-to-day roles. The ORR Safety team could have tried to implement their CRM themselves or chosen to partner with another agency or consultant--but we knew our unique position as their existing marketing partner and our deep knowledge of building custom sales systems. We used this onboarding period as an opportunity to build a truly custom system designed around the ORR culture and their roadblocks in getting experienced sales professionals to adopt an entirely foreign online system. By the time we launched on October 1, 2017, we knew we were faced with the challenge of training the ORR Safety team to run toward this system and truly embrace it. We knew an unused system would be a total waste of time and energy. We trained existing team members with flexible, interactive webinar sessions while keeping our pulse on any content that could be recorded and re-purposed for future training and onboarding new team members. 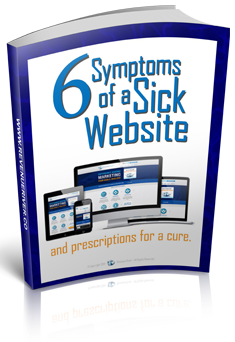 Still today, we see spikes in traffic to this microsite each time we add new feature trainings. We also nominated HubSpot CRM Super Users on the ORR staff--who were exceptionally excited and fast-adopting team members who exemplified embracing this system, helping their team members learn, and advocating for their regions. These Super Users became empowered leaders within their own teams on how to use the CRM, fielding day-to-day questions, and scaling our operations from the inside even faster than we could as their partner. “It was kind of stressful initially, but Emily Cray (Sales System Architect at Revenue River) has been a godsend. 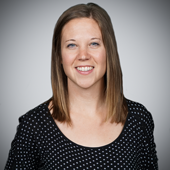 She’s been integral in getting the HubSpot CRM implemented and answers all of our questions. She relieved all of that stress. We stood by ORR Safety to solve with technology and demonstrate our commitment to their success. While the emotional impact of this sales enablement system is a win in itself, we also saw incredible lifts in our key success metrics between our initial launch and our recent one-year anniversary. Click play to hear how important creativity and custom solutions were to Zach and his team while implementing the CRM. The ORR Safety team sees these metrics often through our success dashboards. We knew from our existing partnership that ORR had fostered a competitive culture always striving for growth--and that we could leverage this shared mindset to “gamify” our sales enablement reporting. Within the first 9 months of post launch, we saw an increase in sales CRM activities associated to deals increase from an average of 15 per deal to 23. This increased use of our system correlated with more deals getting created--and tracked closed won revenue increased by 270%. Our efforts throughout this build were sustainable, customized, and proactive. 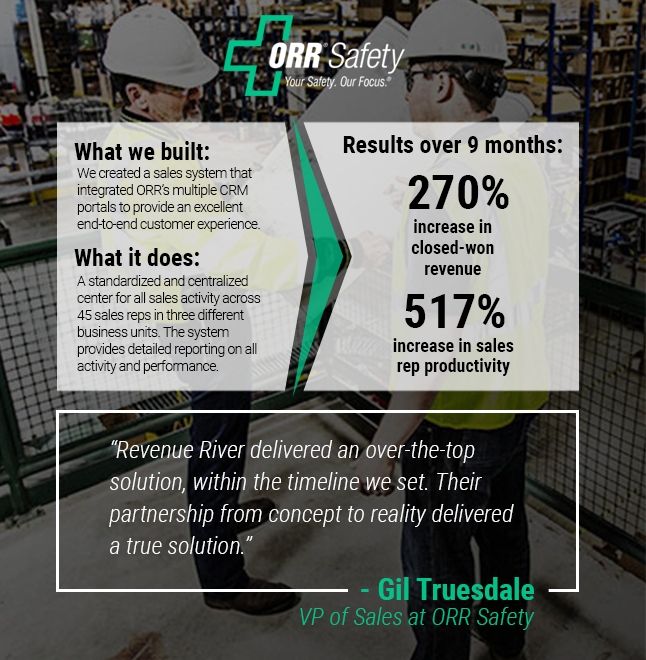 Over this year, we increased the capabilities of the ORR Safety team to modernize and scale the daily work of their sales team, reduce friction for their prospects, and more efficiently track the KPIs and success metrics of their marketing efforts. We’ve proven value as their partner not only in the results, but in our commitment to their growth and peace of mind in their investment of HubSpot. Click play to learn Zach's view of the before-and-after transformation of ORR sales with the HubSpot CRM. Today, we’ve seen an incredible acceleration of the system we built for ORR Safety into sales enablement 2.0. While a year ago we were just starting to train Associates on the tool itself, we’ve now grown to a new stage of adoption: aggressive weaponization of the system to close-loop report on marketing campaigns and their direct impact on sales. All ORR Safety team members have now moved to Sales Pro seats, and we’re fresh off a launch of using campaigns tags to increase our visibility on the ties from revenue made back to first touch and sources. The team has embraced templates and sequences to increase their efficiency and further reduce friction for prospects. We’ve advanced their use of the HubSpot Reporting Add-On to include unlimited dashboards to allow us to make more customized, advanced snapshots of our KPIs dissected by each of the 6 sales regions. And our 5 Super Users join us for quarterly trainings and feedback sessions to make sure we receive all team feedback about the system so that we can continuously improve their experiences with HubSpot. Finally, we’ve launched a large initiative for our closed-loop reporting that requires campaign tags for each contact record on a deal and parent-child reporting. This allows our marketing team to see total revenue associated with campaigns by deal stage and helps us find the highest-impact marketing sources. Our sales enablement partnership always has room to grow, and in 2019, we’ll continue to push for consistent adoption month to month and steadily growing the team’s use of nuanced features in the tool. We’re focused on proving our value by helping the ORR Safety leadership fight against stagnation that comes with any system adoption. Focus more on lead routing and segmentation to match target accounts and align with ORR Safety’s ABM efforts. Use of Products in HubSpot to improve our closed-loop reporting on attributed marketing campaigns. Solidifying total leadership buy-in on the HubSpot CRM as a permanent solution instead of the original temporary-use mindset. Click play to see where the ORR team sees their future using HubSpot and Revenue River to grow and scale. 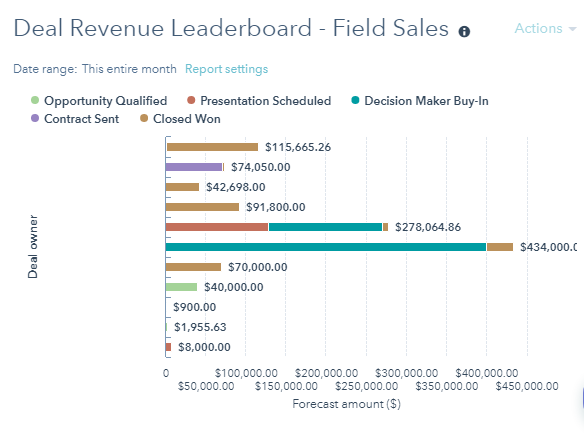 If you (or your sales team) have seen your closed-won numbers slip or felt like you’re grasping for leads, then you’ve likely lost touch with the modern buyer’s journey. Engage with us now to build a sales system that your team actually uses to find better prospects faster.